This June I made two early morning hikes high up in Yankee Boy Basin, a high mountain valley above Ouray, Colorado. On Monday I woke up at 2am, drove up to Yankee Boy Basin, and hiked in the dark via headlamp up to the ridgeline of Cirque Mountain, a 13-thousand footer with a nice view of neighboring Mount Sneffels. With a solid overnight freeze, the snowpack was hard as a rock and the hiking was easy with my crampons. Dawn was just starting to break when I got to my destination, so I put on all my layers, put the hand warmers in my gloves, and hunkered down behind a big rock out of the chilly wind while I waited for the sunrise. Sunrise alpenglow light shines on the summit of Mt. Sneffels, 14,156', as seen from the east - June. For the second hike, on a clear night this June, I woke up and got out of bed at 1am, hiked up Mt. 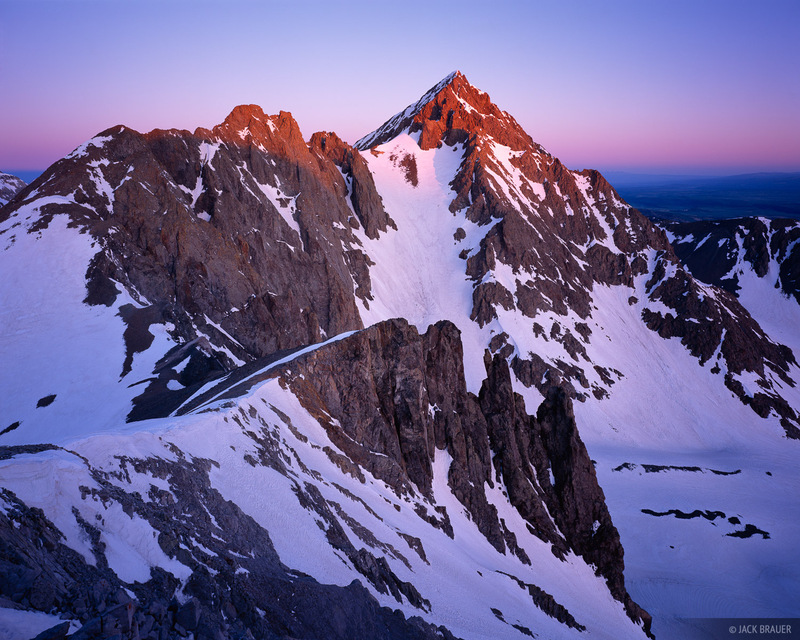 Sneffels under a brilliant full moon, and topped out on the 14,156' summit at 4:15am. 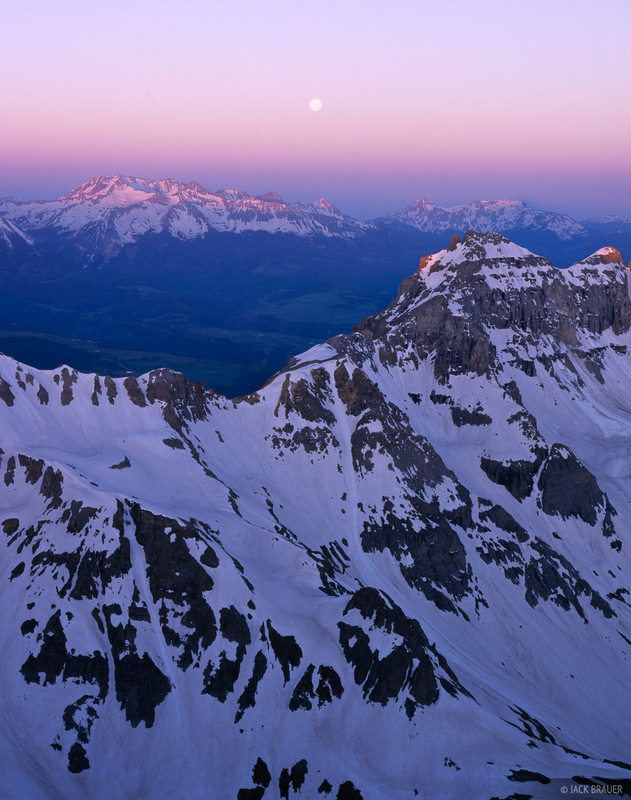 The air was really calm and not that cold, and I had plenty of time to relax on the summit before the dawn light, enjoying the massive vista of moonlit peaks. Once the sun started rising, the photography was fast and furious, and I got some large format shots with the 4×5. 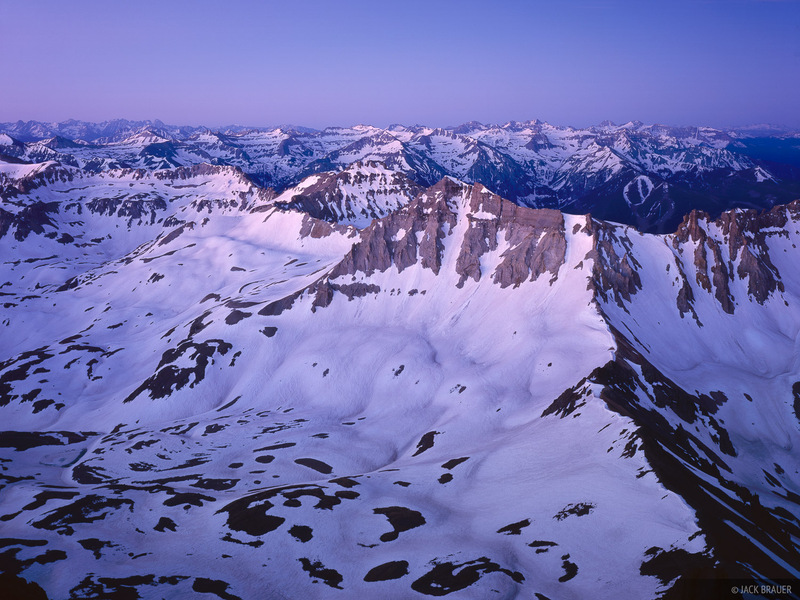 Dawn glow illuminates the San Juan Mountains, as seen from the summit of Mt. Sneffels, 14,156' - June. A full moon sets above the San Miguel Range, which includes three fourteeners: Wilson Peak, Wilson Mountain, and El Diente. As seen from the summit of Mt. Sneffels - June. 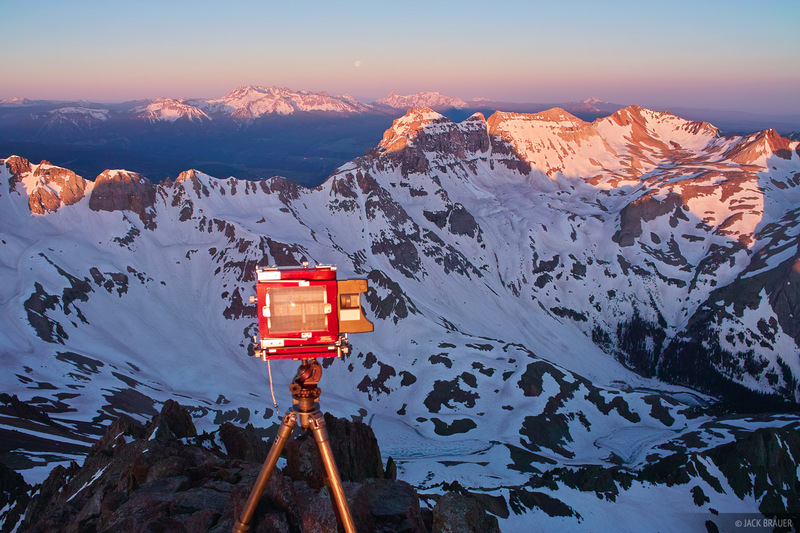 My 4x5 camera on the summit of Mt. Sneffels. Posted in Colorado and tagged San Juan Mountains, Colorado, 14ers.